When asked if we would provide a game of Cage Cricket as a prize for Active Surrey’s Workplace Challenge we were of course delighted to oblige. The worthy winners of the prize were the ever-toiling employees of Reigate and Banstead Borough Council. On a sunny midweek evening, a group of 8 congregated in Priory Park in Reigate for the game. They included current and former cricketers along with a couple of relative newcomers to the game. However, this range of experience didn’t prevent the game from being one the most competitive that we have run. Everybody really enjoyed the game scoring lots of points and the banter / sledging, though never cruel, was certainly very entertaining. 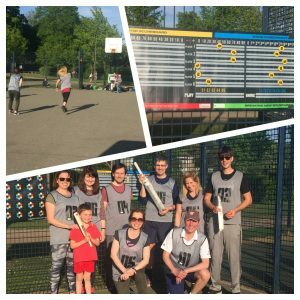 This was a fantastic event and confirmed yet again that Cage Cricket can provide a very satisfying sporting and social activity which people can fit into their busy lives.